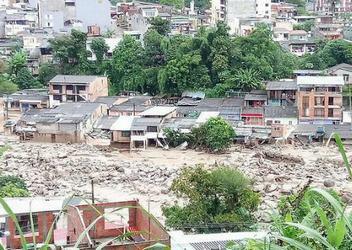 MOCOA, Colombia, April 4, 2017 (ENS) – Torrential rains caused three rivers to burst their banks in the Colombian city of Mocoa early Saturday morning sending water and debris crashing into homes. 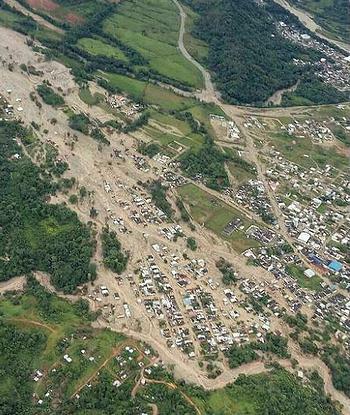 The flooding and mudslides have claimed 254 lives and left hundreds of people missing. Thousands scrambled to evacuate, and hundreds of people have been injured. Environmental authorities calculate that the rain that fell in a few hours equaled the amount of rainfall during 10 days in this area of ​​the country under normal conditions. The Minister of Environment and Sustainable Development Luis Gilberto Murillo, expressed his solidarity with survivors and families of those killed by the avalanche of water and mud. He pledged support for those affected by the overflow of the Mocoa, Mulato and Sancoyaco rivers in Mocoa, the capital of Colombia’s southwestern Putumayo province. The minister emphasized that one of the priorities of his portfolio has been prevention and early warning of extreme weather and climate incidents. “We have been very active in warning, since August of last year, as we also did last March 6, about the probability of emergencies. Because of increased rainfall, however, we must understand that the magnitude of this natural catastrophe outweighs the odds of any environmental prediction,” he said. “Beyond warning, we have given guidance and have been helping local authorities in the country in the formulation of mitigation plans,” said the minister. During a flyover of the emergency area in Putumayo on Tuesday, Murillo announced an initiative that will recover environmentally the upper part of the Putumayo River basin. He said that thanks to the conservation of a forest, one of Mocoa’s neighborhoods was saved from the deadly avalanche of mud and water. “In today’s flyby we detected that the neighborhood of El Carmen has a reserve of trees, and that really prevented the avalanche from ravaging it. This confirms that we must have the ecosystems in good condition in order to recover them,” said Murillo. In conjunction with the Ministry of Transport, he said, pipelines and hydraulic works will be carried out at critical points in order to be able to reuse rainwater. The environment minister also announced an initiative to work on the recovery, restoration and reforestation of the entire upper and middle river basin. Today officials reconfirmed the critical areas for action and identified a new risk zone. The environmental authorities recommend continued monitoring for possible landslides and potential blockage of the rivers with debris. The Institute of Hydrology, Meteorology and Environmental Studies, or IDEAM, has issued a red alert for sudden surges in the upper Putumayo and Caquetá river basin. IDEAM is also warning of more landslides in Mocoa and Villagarzón and has issued an orange alert for San Francisco and Santiago in the upper Putumayo. According to Luis Alexander Mejía Bustos, director of the Corporation for the Sustainable Development of the South of the Amazon, or Corpoamazonia, the confluence of environmental and geological aspects associated with the Amazonian piedmont landscape complicates the situation. “We have that sum of coverage, rocks and bodies of water that cross the city until it ends at the Mocoa River. Now it is necessary to try to locate a new canal that allows to efficiently evacuate the amount of mud, stone and vegetal material that was deposited,” he said. Minister Murillo said he will lead a project to generate Colombia’s first technical guidelines for future housing reconstruction projects that must take risk scenarios into account.